We’ve been in Bimini for a week now, enjoying our time with locals and waiting out the latest blow. We bought a couple of good sized lobster tails from one of the local fisherman and I made a killer lobster curry out of them. Delicious!! We also met a great couple, Bobby and Megan, at the dock after lending a hand to land their boat. 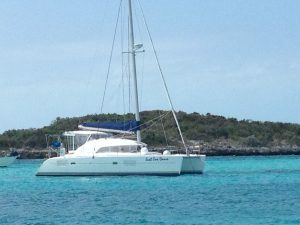 They are planning to sail the whole Caribbean chain, ending up in Grenada by June. Bobby has a YouTube channel called Sailing Doodles, named after his two Labradoodles Goose and Maverick, that chronicles their trip on their boat, Ruff Seas. We checked out some of their videos, they’re excellent! You can see them at YouTube\Sailing Doodles. We’ve also been planning our next hop over to Nassau. 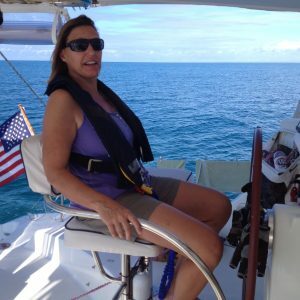 We looked at possibly stopping at Mackey Shoals and then jumping over to Chub Cay before crossing the Northwest Channel to Nassau like we did last year, but Mackey can be extremely bouncy since it’s an unprotected open water shoal and the marina at Chub Cay has been shut down since Hurricane Matthew passed through (and its way too expensive). 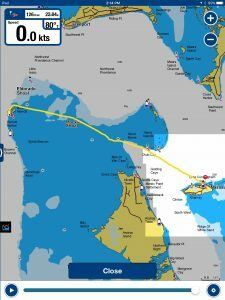 Plus, that route would stretch the trip to 3 days and we’d like to get to the Exumas as soon as possible. So, instead we’re planning a 24-hour run from Bimini to Nassau. 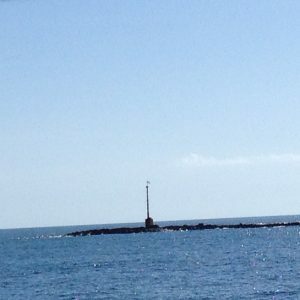 We’ll leave Alice Town, head to North Rock and then turn east and steer for the Northwest Channel light. Until we reach the Channel, we’ll be on the shallow Bahama Bank where we can be in 15 feet of water even when we’re outside the sight of land. Once we reach the Channel though the water will drop to depths of several thousand feet. Open to the currents of the Atlantic Ocean and a wide strait called The Tongue of The Ocean, this is another area where wind can build against current and cause hellacious waves. Even the dockmaster at Brown’s warned us of this, regaling us with a near-death experience he recently had in a 35-foot boat. We ready JOD to leave the dock at 3:00 pm, figuring this will let us cross the wide-open Bahama Bank at night and allow us to reach the Channel at around dawn. We can then size up the waves in the Channel and if they look too dangerous we can skirt the edge of the Channel to Chub Cay and anchor there to wait for more favorable conditions. Our plan is that we will do 2 six-hour shifts overnight, me taking the first watch from 6 o’clock to midnight and Cindy taking midnight to morning. Our previous overnight trip we had done 2 hour watches and found that that did not allow the off-watch person enough time to really get any sleep. However, as we start up our electronics, Otto the autopilot does not come up. Crap!! That messes up our watch schedule, since having the person at the helm actively steer for 6 solid hours is just too much. We decide to go back to 2-hour watches and pray that Otto decides to come up along the way. We reach North Rocks and point JOD to the east. The weather is clear and the shallow waters of the Bank are calm which makes for beautiful sailing (well, motoring) conditions. At this time of year, we are in twilight by 5:30 and by 6:00 we are in full darkness. We eat dinner, leftover lobster curry, and then Cindy heads below at about 8:00 while I take the first watch at the helm. At one point, Otto’s display changes from “SeaTalk Failure” to “Standby”, which gets us excited but we still can’t switch from “Standby” to “Auto”. Still, we’re hopeful this is a prelude to Otto waking up. Unlike our Gulf Stream crossing, the sky is clear and a striking half-moon lights up the night. The beauty out here on the open water at night is almost indescribable. The moon casts a long silver trail across the nearly flat surface of the water. I see occasional shooting stars streak across the night sky and mark the passage of time by the moon’s trek across the heavens. Except for the steady thrum of JOD’s engines, all I can hear is the soft rush of waves sliding along our hulls. Apart from a few fellow cruisers and an occasional local fisherman, we encounter no other boats; the waters of the Bank are too shallow for large container vessels. Throughout the night, we keep trying to fire up Otto but no dice. We make such good progress that we reach the Northwest Channel a couple of hours before dawn. 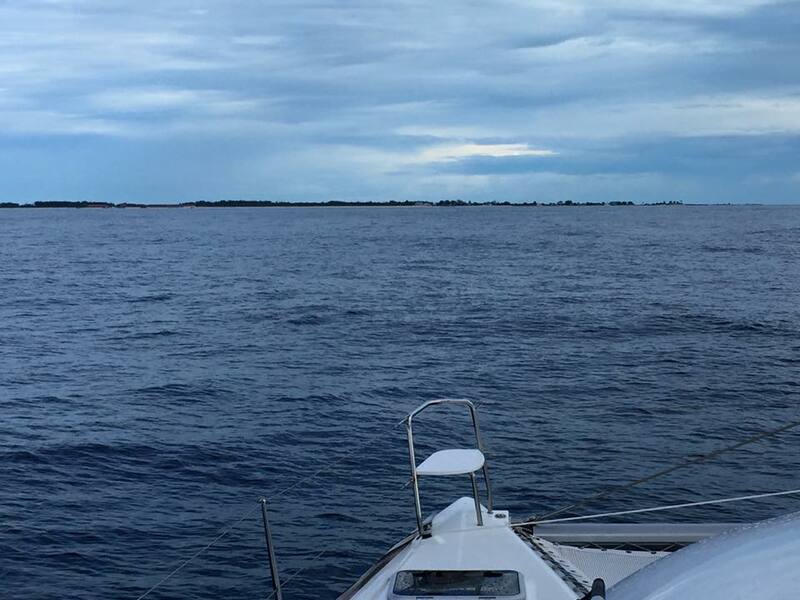 Neither of us wants to get out into the open water of the Channel without being able to see what kind of seas we’re facing, so we opt to stay at the edge of the Channel, heading toward Chub Cay. This puts us on a less direct course to Nassau but maintains the option of bailing out and anchoring at Chub. Here in the deep waters of the Channel, shipping traffic picks up. Cruise ships head into and out of Nassau, freighters ply the trade routes and ferries haul people, cars and mail to the surrounding islands. We start picking up AIS signals left and right, though by staying in the shallow edge of the Channel we avoid any close contact with these. At around 5:00 am though I pick up several faint lights on the distant horizon. I see no AIS signals in that direction so I start visually tracking them. If you’re watching a boat and the relative line of sight angle does not change, you are on a collision course. These lights are moving but they are difficult to comprehend. Boats underway at night should have a white steaming light amidships, a green light on the starboard bow and a red light on the port bow. This helps you determine the vessel’s direction the vessel and determine who has the right of way. These lights are all white and there are several of them; I can’t tell how many boats there are or where they are headed. I steadily track the lights and consider waking Cindy; our standard practice is to get a second set of eyes to assist the helm if we are possibly on a collision course. Then I notice that the tallest light is blinking and realize what I’m seeing is Chub Cay; the blinking light is the Batelco cell phone tower. Soon I can make out the horizon and within 30 minutes its light enough to see the water. Thankfully it’s calm as a lake out there though I can see clouds on the horizon as well. Cindy comes up to the cockpit and we check the radar to see if there are any storms between us and Nassau. It looks clear despite the clouds so we decide to swing to the south and press on to Nassau. Even with clouds, sunrise on the water is striking. A warm glow precedes its upper edge breaking the horizon. Soon its bright orange-yellow edge is visible, silhouetting the horizon in front of it. The speed at which it rises, which the horizon makes apparent, is remarkable. Even when it moves behind the lowest band of clouds, it backlights them in heavenly orange light. It’s hard not to feel reborn at the sight of it. Better yet, the sun quickly drives away the clouds we had been seeing and soon it’s a beautiful blue-sky day. We listen to Jimmy Buffet’s Margaritaville station on our SiriusXM radio, another luxury we added during our stay in St Simons, and trade out time at the helm (Otto is still down for the count). Our passage is uneventful and after about 4 hours we can make out the tall buildings of Atlantis and Baha Mar on the horizon. 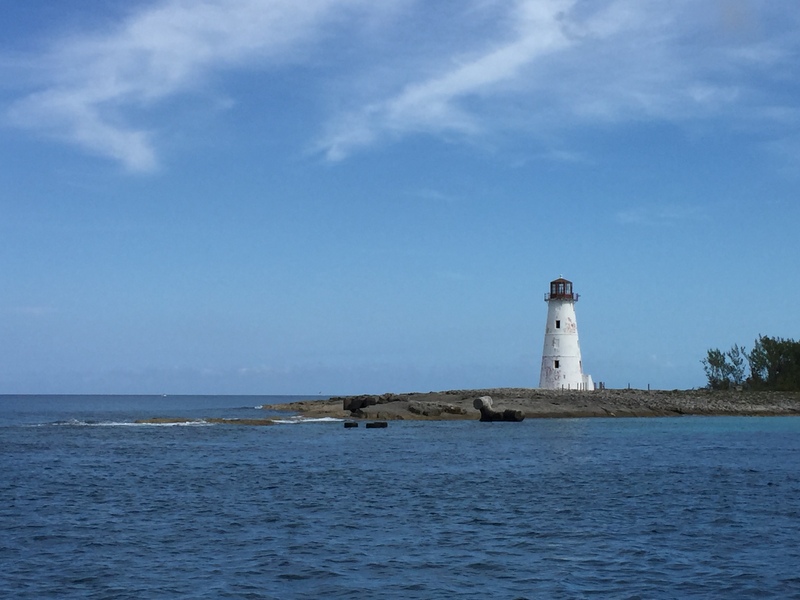 As the Nassau lighthouse (purely ornamental, it hasn’t functioned in years) comes into view, we hail Nassau Harbor Control and obtain permission to enter the harbor. The harbor is packed with its usual contingent of cruise ships; we’ve seen as many as six in port at one time. Cruising is big business in Nassau and they do whatever they can to accommodate these behemoths. On any given day thousands of tourists are disgorged from their bowels and can be seen wandering around the downtown area looking dazed as sidewalk hucksters try to funnel them into their stores and bars with promises of free rum cake and 2-for-1 drink specials. We hail Bay Street Marina and after another harrowing approach (it’s almost impossible to dock at Nassau at a time when there isn’t a vicious current ripping through the harbor) we’re tied off safely in the same spot we occupied last year, 22 hours after we left Bimini.